Sarah Crossan Archives - Book.Blog.Bake. Alina has been stealing for a long time. She’s a little jittery, but not terrified. All she knows is that she’s never been caught before. If she’s careful, it’ll be easy. If she’s careful. Quinn should be worried about Alina and a bit afraid for himself, too, but even though this is dangerous, it’s also the most interesting thing to happen to him in ages. It isn’t every day that the girl of your dreams asks you to rescue her. Bea wants to tell him that none of this is fair; they’d planned a trip together, the two of them, and she’d hoped he’d discover her out here, not another girl. For some reason, Breathe reminds me of Under the Never Sky. It’s not the plot or the characters or anything, but it just seems similar in writing style and tone. As I read, I couldn’t help but to think of Under the Never Sky, even though I ended up liking Breathe much better. For a Dystopia standpoint, I find the world that’s created in Breathe well-done because it only seems unlikely, not impossible. Sarah Crossan bridges what’s currently going on in the world–the mass cutting of trees– with what could happen as a result in the future, and it’s frightening. The pod was easy to imagine, unlike some Dystopia settings. I liked each of the three main characters in this book. They were all sympathetic while still being completely different, and their development as the plot progresses is evident. Alina realizes what is exactly so important about the world she’s fighting for, while Quinn emerges from a sheltered standpoint to become an informed and incredibly brave character. Bea starts off the story willing to do anything to protect her family, and while she still has that urge by the end, she realizes the bigger picture that she wants to help the world achieve. One of my favorite things about this book is the way the three main characters relate to their families. Alina is an orphan who has been fighting because of what happened to her parents, but both Bea and Quinn have a significant amount of interaction with their families. Bea in particular has a family that’s devoted to her and she to them, which unfortunately seems to be a rarity in the books I’ve read recently(with a few exceptions). Quinn’s father is probably the most interesting secondary character in the novel. He has this secret life and seems completely heartless at times, but then he does something and you realize he’s just an incredibly flawed human. While I thoroughly enjoyed Breathe, I did have a few problems with parts of the book. For one, the narration switched between the three main characters. I like this technique when done well, but Alina’s voice and Bea’s voice were too similar and sometimes made for a confusing read. Sometimes I’d get a few pages in, realize that I didn’t know who was speaking, and have to go back to the front of the chapter. Also, while the story is well-told, some of the writing was a bit repetitive. Sarah Crossan wrote some magnificent sentences, but she also wrote some that were completely confusing and repetitive. This wasn’t a constant, which makes me think it may have been an editorial error instead, but it was frequent enough to be noticeable. There were probably about 5 or 6 times throughout the book where the same word would be used in one sentence, and it just threw me off. There also seem to be a lull in the middle of the book. I flew through the first forty percent of the book, but between the forty and fifty-five percent mark I dragged. The ending, however, was phenomenal. It’s not a completely wrapped-up ending–there’s definitely a bit of a cliffhanger–but it does have this nice, quiet quality almost. It’s hard to describe how I feel about the ending, but it’s probably the most perfect way I could think of for a series starter such as Breathe to end. 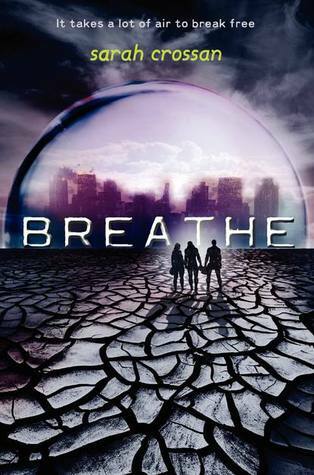 Final Impression: At times the writing was a bit distracting, and I couldn’t keep up with the narration switches, but on the whole Breathe was an enjoyable Dystopia read that had a world that made sense. I really grew to love the characters and their developments the more time I spent with them. Breathe has a great ending in my opinion, and I’m excited for the next installment in this series. 4/5 stars. You can find Breathe at Amazon, Barnes and Nobles, or the Book Depository.